If you're suffering from PCOS, don't overlook the possibility that bacterial infection could be playing a hidden role in your problems and symptoms. Here, we'll just mention a couple of possibilities: Helicobacter pylori, and Chlamydia. There is a wide range of supplemental nutrients that can help you alleviate symptoms of PCOS (polycystic ovarian syndrome) and reduce the incidence of ovarian cysts. Nutritional supplements are vital for your health but every person has somewhat different needs. Years has been spent researching and identifying the best solution for each problem. Visit Supplements Guidelines for guidance on which nutritional supplements may be appropriate for you. Not too many years ago stomach ulcers were a mystery. No one knew the cause. It's now commonly accepted that ulcers are caused by a bacteria called H. pylori. Even though H. pylori is a common infection that doesn't always produce symptoms, it can become a health problem. Surprising research from Adnan Menderes University in Turkey has now associated H. pylori with polycystic ovary syndrome. In this study, 35 women with polycystic ovarian syndrome were compared to 50 normal women for H. pylori antibodies in the blood. 40% of the PCOS women showed evidence of exposure to H. pylori vs. only 22% for other women. In other words, the rate of exposure to H. pylori in women with polycystic ovarian syndrome was nearly double the rate for other women. Why women with this disease may have a higher exposure or higher infection rate is not known. Whether H. pylori might in some way contribute to polycystic ovary syndrome problems is a mystery. We'll have to await further research. This new research is nothing to be alarmed about but is something to be aware of. Meanwhile, what might you do, if anything? You could consume antioxidant nutrients, either as part of a healthy diet, or as supplements. When vitamins C and E are given in addition to antibiotics, the eradication rate of H. pylori is significantly higher than when using antibiotics alone. 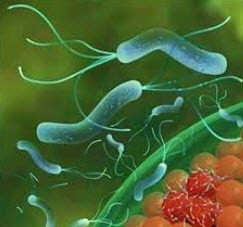 The antioxidant nutrient n-acetylcysteine (NAC) has also been reported to help eradicate H. pylori. 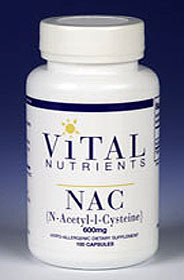 In addition, NAC may improve your fertility as well as reduce insulin resistance in women who have PCOS. Insulin resistance is a major cause of polycystic ovary syndrome. Does Chlamydia Make PCOS Worse? Many women who suffer from polycystic ovary syndrome don't know that chronic inflammation plays a huge role in their symptoms. To learn more about how inflammation relates to your situation, click here. We were surprised to find a study showing that a chlamydia infection is associated with chronic inflammation in women who have symptoms of polycystic ovary syndrome. Chlamydia is the most common sexually transmitted bacterial infection and is a leading cause of blindness worldwide. A Finnish study compared 81 women who had hirsutism and no menstrual cycle to 1,427 women in the general population. The 81 women with PCOS symptoms were 1.5 - 2.4 times as likely to have antibodies to chlamydia than the other women. They also showed evidence of higher levels of chronic inflammation. The researchers concluded: "Chronic inflammation, which is associated with chlamydial infections, could contribute to the pathogenetic processes that lead to the metabolic and hormonal disorders of PCOS." If you have a chlamydia infection, you should get it treated. But more importantly, this study suggests that any infection that leads to a state of systemic, chronic inflammation is a cause for concern. Besides treating any infection, you can also eat healthy, whole foods. Processed junk foods contribute to chronic inflammation. Whole, fresh unprocessed foods such as vegetables have a mild anti-inflammatory effect. Thousands Of Women - Just Like You - Have Overcome The Negative Effects of PCOS By Following The Advice in Our 490-Page PCOS Diet eBook. Visit our PCOS Diet eBook page to download your copy today. Yavasoglu I et al, A Novel Association Between Polycystic Ovary Syndrome and Helicobacter pylori., Eur J Endocrinol. 2009 Jul 23. [Epub ahead of print]. Sezikli M et al, Oxidative stress in Helicobacter pylori infection: does supplementation with vitamins C and E increase the eradication rate?, Helicobacter. 2009 Aug;14(4):280-5. Millea PJ et al, N-acetylcysteine: multiple clinical applications, Am Fam Physician. 2009 Aug 1;80(3):265-9. Yanaka A et al, Dietary Sulforaphane-Rich Broccoli Sprouts Reduce Colonization and Attenuate Gastritis in Helicobacter pylori-Infected Mice and Humans, Cancer Prevention Research 2: 353 360. Morin-Papunen LC et al, Chlamydia antibodies and self-reported symptoms of oligoamenorrhea and hirsutism: A new etiologic factor in polycystic ovary syndrome?, Fertil Steril. 2009 Nov 18. [Epub ahead of print].